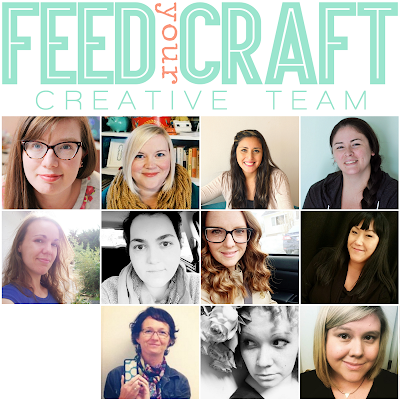 feed your craft: Meet the 2016 Team! It's an exciting day as I get to introduce you to the 2016 Feed Your Craft Creative Team! Coming back this term are Brandi Kincaid, Cari Orellana, Jana McCarthy, and Nathalie Leonelli who are joined by ladies that no matter your style, I believe will inspire you. Please welcome Amy Jo Vanden Brink, Dawn Ritchie, Elodie Lusseau, Krista Wells, Marie Friant, Olga Moss, and Tracey Fox. Many of the ladies are fellow bloggers, so if you are looking for more in depth inspiration, be sure to head over and visit them. All can be found on Instagram, which is such a fun way to learn more about them and see what's going on, so give them a follow. Can't wait to check out everyone's work! Congrats to all!